Oh I'm so sorry I fell off the face of the earth and left my blog all... stale I guess! Well, I'm back. We took a last minute trip to Utah and I've been in recovery mode since. My laundry (and kids' sleep schedules) are finally back under control and I'm excited to post some fun recipes I've been working on. For today, though, I have my submission to this month's "You Want Pies with That" event- and the theme is Summer Drinks. Well, I don't really drink anything but water (or an occasional glass of milk with a cookie) but everytime I drive by Sonic I crave a cream slushie. So, when limes and berries were on sale, I knew my choice was made for me. Now I really wanted this pie to turn out cute and fun, so I thought I would swirl the two batters together for some color contrast. I froze the pie and when I served it up it was so SOFT! I'll admit I was pretty heart broken. Just now, though, I realized my problem- I had forgotten to bake the key lime for a few minutes (I think I mixed my two baking favorites, Ina and Dorie, up- Ina's key lime pie is frozen but Dorie bakes hers first!) So, I guess the moral of the story is to "do as I say not as I do". Either way, this was yummy and I'm going to make it again and actually follow my own proper directions. Ahem. I think I needed a nice summer drink to cool my head down and pay attention! Don't forget to check out the rest of the Pies! Working with a stand mixer, preferably fitted with a paddle attachment, or with a hand mixer in a large bowl beat the egg yolks and lime zest at high speed until thick and pale. Reduce the mixer speed to low and beat in the condensed milk. Still on low, add half of the lime juice. When it is incorporated, add the remaining juice, again mixing until it is blended. Pour into the shell and bake the pie for 12 minutes. Transfer the pie to a cooling rack and cool for 15 minutes. Meanwhile, whip the cream cheese and sugar until it's soft and fluffy. Fold in the whipped cream and lime zest and pour over the key lime pie. Stir in or garnish with some raspberries and transfer to the freezer for an hour or two. Serve and enjoy! Haha, my pie turned out really soft too for some reason, still not sure why...but either way this one looks SUPER delicious! I will definitely have to give it a try (with baking time included!) :) I LOVE cream slushies too! Mmm, this looks great!! 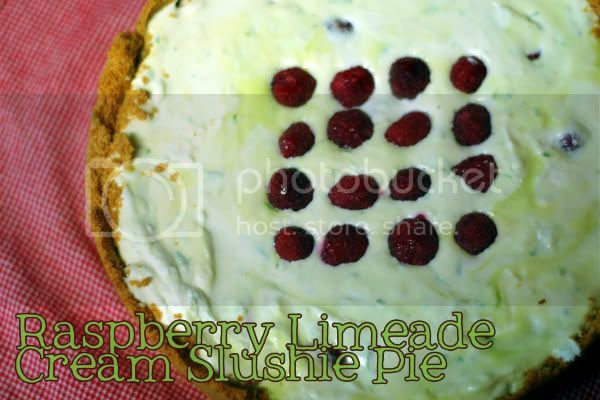 Any pie with limeade in the title sounds like a winner to me!! I LOVE limeade. In fact, I almost made a Strawberry Limeade pie. I can't wait to try something like this! MMMMMMMM I think this sounds pretty dang tasty!